Shooting fundamentals dictates that the most important sight is the front sight as that's the one that rests over the end of the barrel. As a result, the front sight dictates where the bullet will land far more than the rear sight does. For those who shoot using the front handgun sight and the flash sight picture, it's really the only sight that matters. But how to make it stand out more without blowing a lot of money on night sights? As it turns out, there are a few ways that a person can enhance their front sight without breaking the bank. One of the most commonly upgraded handgun components are the handgun sights, as factory sights aren't necessarily to everyone's satisfaction. 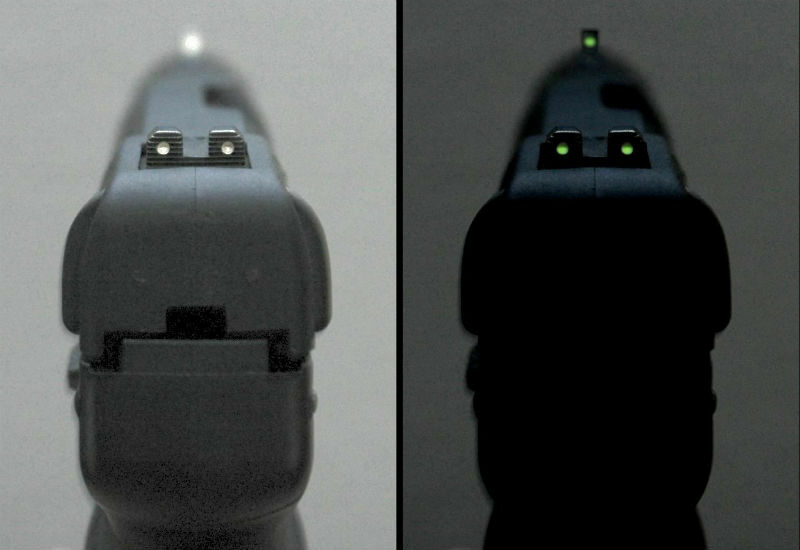 They may be too small, they may be cheap iron sights that are hard to see in low light conditions or for shooters with less than 20/20 vision. For people who only train for using point shooting, it may not matter as much...but that's another matter. However, not everyone wants to necessarily spend the requisite cash on a set of sights, along with having them installed by a gunsmith or performing the installation themselves. A person may not be able to upgrade the sights. Some pistols have iron sights that aren't removable, which means the slide has to be machined or replaced with a slide that can have the sights removed and replaced, which not everyone is willing to have done. After all, a good number of pocket pistols don't have adjustable sights. Neither do some of the budget 1911 pistols from some makers. However, is it worth spending $350 in having the slide machined and a set of Trijicon, Novak, or XS sights installed on a $250 gun? Some people don't think so. 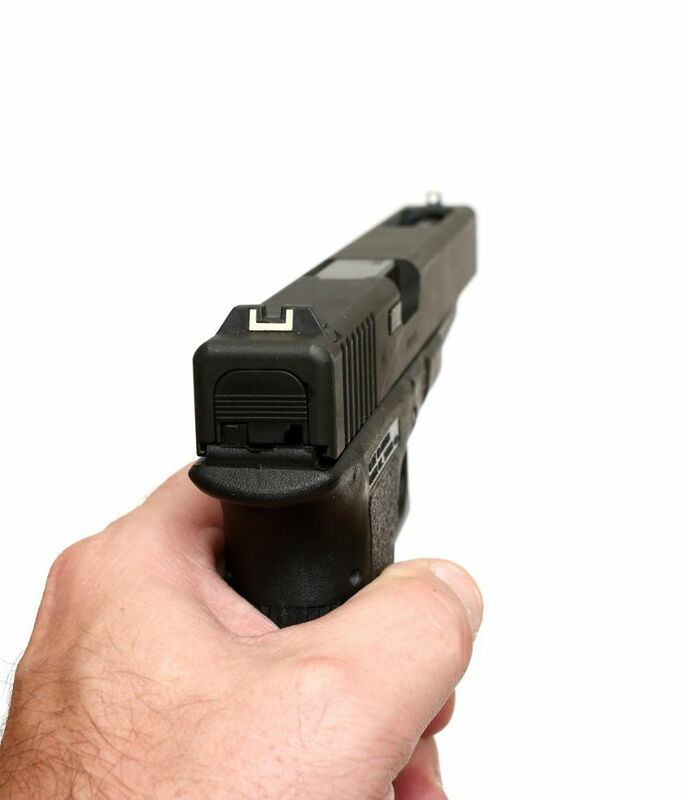 This leads to the realm of handgun sight hacks, where a person improvises a solution to improve the sighting of their handgun by something other than conventional means. A fantastic example was that of Col. Charles Askins, Jr., the legendary competitive shooter/border patrolman/Army officer/gunfighter and gun writer extraordinaire. During his time as a member of the US Border Patrol, Askins tied a white handkerchief to the end of his Remington Model 11 shotgun, to better index the barrel at night. Nail polish. This is one of the oldest tricks in this particular book. Ladies' nail polish is a great cheap trick in order to put some color on a front sight. If you happen to BE a lady who wears nail polish, you might already have the stuff! If you live with one, she might. Otherwise, it's pretty cheap to pick up. Look for the whitest white possible, or a color that will easily stand out in low light conditions. There are glow-in-the-dark nail polishes out there too; those may be well worth the look. Fishing lure paint. Fishing lure paint can endure more than nail polish, as it's meant to endure submersion in water and the wear of being tossed through the air by the fisherman in search of tasty pescetarian treats in the evening. (When fishing is best.) However, look closely at the paint in question. Some types of lure paint require heating the lure before applying, which may be impractical with a handgun sight. Make sure it can be easily applied. Any old glow paint. There's plenty of generic glow-in-the-dark paint out there. Find some, and paint your sights how you want. Depending on the paint, you may have to regularly strip and reapply to keep it effective, so be prepared for that. Otherwise, it should work fine. If you find a paint pen with a fine applicator tip, that will make it even easier. Automotive paint pen. An automotive paint pen is much like any other paint pen - it's for filling in dings, scratches and such. You can use it just like nail polish, as in you apply a coat of paint to the front sight and let it dry. Likewise, you'll want to use a shade that will show up well in low light, so bright white (Alpine white is good) and other bright colors are good. (British Racing Green is a wonderful color...but not so much if you need to see it at night.) The difference between this type of paint and others, though, is automotive paint is formulated to stick to metal. 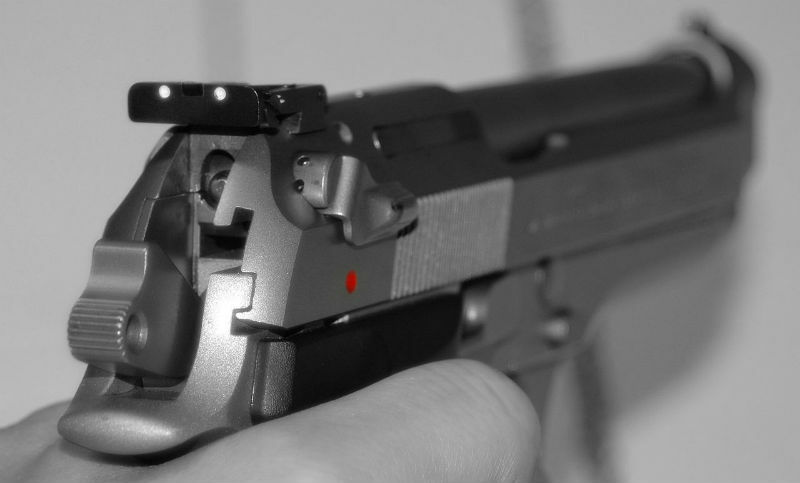 The reason a person may want to think about upgrading their sights is that defensive gun use occurs when it occurs, rather than when it's convenient. 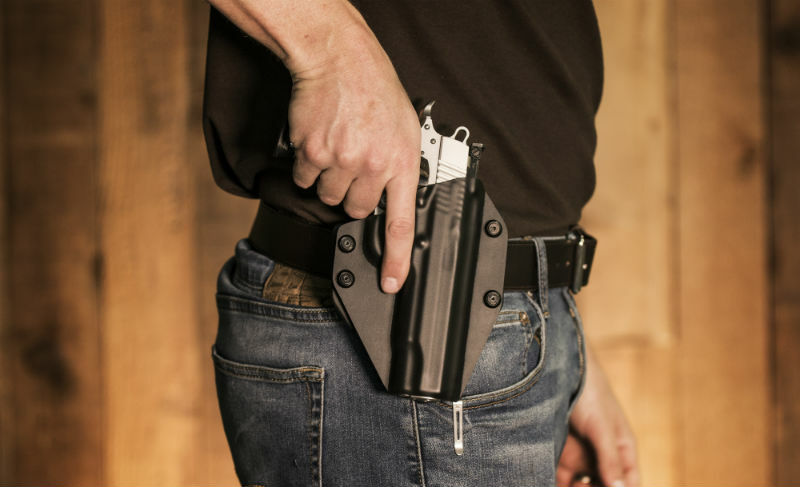 After all, a person puts on a pistol, holster and gun belt it's to address what may potentially happen at any time - not what might happen when convenient. Most studies into police shootings and also civilian shootings reveal that shootings happen more often in poor light than in good light, so this is something you should be aware of. Altering sights to be more visible at night is a good start. Practicing point shooting is as well, since most shootings happen at very close range.